“The people that I go to church with and the people who live in the place I live, in West Texas, are the people who are most doubtful that [climate change] is a real problem, and who are being targeted and misinformed by the people whom we trust. 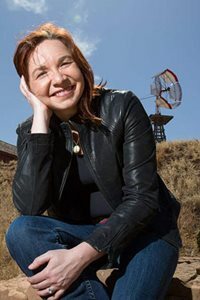 The Christian digital magazine Plough has a great interview with the Texas Tech University climate-change expert Katharine Hayhoe, a much-respected scientist with the peppy, engaging personality of front-desk clerk at a beach resort. Few scientists are as adept at explaining at the grass-roots level how we are changing the climate–and how dangerous it really is right now and to future generations, too. And thank God for her willing to stand up to the abuse she takes from other Christians, who bombard her with astoundingly hate-filled e-mails. And yet it’s not surprising considering the utter contempt that so many people in politics, the news media and the oil & gas industry influential–people with clear political and financial agendas–have for scientists like Hayhoe, Christian or no Christian. “Every time you stick your head out of the ivory tower and tell people in the real world that climate change is real, that scientists agree, and that it’s affecting us now and we need to do something about it, you will get attacked. Unless maybe you’re doing it in Berkeley. What a sad commentary on our times that quote is. At any rate, I commend the whole interview with Hayhoe to you, which can be accessed by clicking here. Or you can take the word of climate-change deniers like Newt Gringich or Sean Hannity or Bill O’Reilly or most of the people running for currently running for President, who apparently don’t believe that NASA scientists put Americans on the moon. I think I’ll go with the Christian expert at the great university in the western climes of Texas Our Texas. Here’s a good resource for climate-change skeptics taken from one of Hayhoe’s own recommended resources. Click here.